» What Is The Best Litter Box For Elderly Cats? One day you realize that your kitty cat has become old and it might seem as though it has almost happened overnight. We are so used to our animals being around, that when we realize they are not as sprightly as they used to be, they have actually been heading that way for some time. This article is about finding a litter box that is suitable for an elderly or senior cat. Why Do You Need A Different Litter box For A Senior Cat? You may not need a different box if your cat is able to enter and exit the current litter box easily. However, if your senior cat has difficulty getting into the box or getting out of the box, it is time to look for something suitable to make it easier on those old limbs. ​Our kitties are living longer ​with access to good veterinarian healthcare​. ​This means that we may ​need to make modifications to help our old cat go about life as comfortably as possible. For an older cat, an uncovered litter box with a low front opening will be the easiest for the cat to get into and out of easily without placing excess strain on aching joints. I hope you are being careful kitty! There are many different types of litter boxes available however there are some that are designed specifically for aging cats. Having a low front entry is the non- negotiable for senior cats. We have also reviewed a puppy litter pan and a ferret litter pan which could be suitable for your elderly cat. 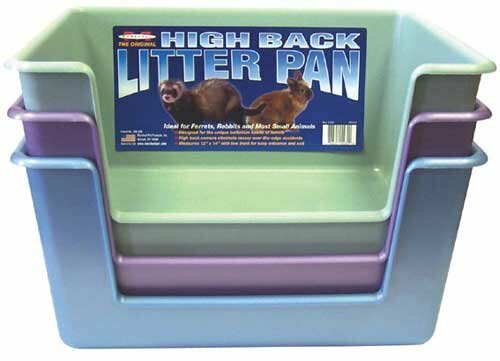 The ferret pan isn’t as large as a normal litter box so this would only be suitable for a very small senior cat. This is a litter box is specifically designed for elderly cats. There are two box sizes and the larger box size is definitely better for an elderly cat. The cat has more room to turn around without being in a confined space. Cats with arthritis or joint pain can find it very difficult to move around so the extra five inches will give the cat more space to move his body around. This can be a slow process for older cats. The sides are not high, 5 inches and the front opening is low, 3 inches to suit senior cats. Even if your cat exits the the box at the side ​it is still a reasonable height all the way around. The measurements for the larger box are 24"x 20"x 5"and the height of the front opening for the cat to enter the box is 3 inches. This is an ​outstanding litter box for a senior cat. The color is 'sand' and it is made in the USA. Don't be put off by the label saying that these pans are for puppies. The manufacturer clearly states that the product is also recommended for senior cats that can’t cope with a traditional litter box. These litter boxes should definitely be considered. The fact that they come in a set of two is very useful if you have more than one cat and want a litter box for each ​cat or you need one for an upstairs ​ and one for a downstairs. 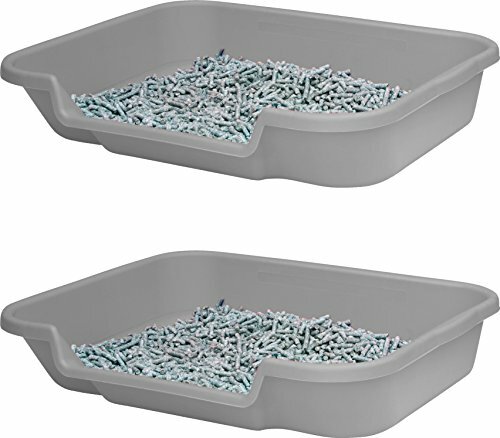 These litter pans are gray. They measure 20 inches wide x 24 inches long. The height of the sides is 5 inches and the height of the entrance opening is 3 inches. This is the same measurements as the Kitty Go Here litter box. If you need two boxes this option would be more economical. ​Click the image for more information. This is a wild card but it might just suit your needs. Clearly this litter box is for ferrets however we have included it here because it does have a very low opening at only 2 inches, which is an inch lower than the other two models reviewed on this page. The measurements are 14 inches x 12 inches and the sides are 7 inches. Sketch out the measurements on a paper and it will give you a better idea of the size. This would suit a small, elderly cat who has arthritis or stiff joints. It would also work well for a kitten. The cat needs to be able to enter the litter box easily, otherwise he may not use the box and pee or poop elsewhere. Cats don’t do this on purpose and if your elderly cat is pooping outside the box it probably indicates that something is wrong. Often it is arthritis that makes it difficult for cats to access the litter box. If it is too painful or difficult for the cat to climb over the opening of the litter box, it means that the opening is too high. The front opening needs to be low to allow easy access. Arthritic limbs make it difficult to climb over anything too high. The opening to the box needs to be low so that kitty can get in and out without being in pain. This may mean that litter will be tramped in and out however this is part and parcel of looking after an aging cat. Put a litter mat at the entrance to help minimize this problem. The box needs to be large enough for your cat to turn easily, so larger is better. Larger is actually better in relation to all litter boxes as mentioned in the study in this article. If possible leave the litter box in the same location. Elderly cats will have memory loss and perhaps dementia, so make it easy for kitty by leaving the box in the same place. Another aspect to location is having a litter box upstairs and downstairs if this applies to your situation. This does happen anyway, elderly kitty or not, however if the box is shallow and the front opening is lower than usual, it is going to stand to reason that there may be litter escaping the litter box. The normal precautions can be taken for this, such as using a litter mat underneath the litter box so that most of the litter is trapped on the mat. Puppy trainer pads underneath the box are a good solution to make cleaning easier if kitty is having peeing outside the box. ​I​ think I dozed off! For all the requirements an elderly kitty needs regarding ease of movement in a litter box, we hands down recommend the Kitty Go Here Litter Box for Senior Cats. This box makes it as easy as it can possibly be for an elderly cat to get in and out of a litter box. The Puppy Pan litter boxes are the same size as the Kitty Go Here box however if you need two litter boxes for different parts of the house, this will the economical option. The wild card, the Marshall litter box for Ferrets could be an outstanding choice, if your cat is small, as the front opening is just 2 inches high. ​It can be quite surprising to realize the real age of our cats. ​Why we changed to using a rai​sed feeding platform for our senior cat. ​How do senior cats with bad teeth manage to eat and what is the best cat food for them? Previous Post Is An Uncovered Litter Box Up To The Task? Next Post What Is The Purpose Of A Secure Senior Cat Porch Enclosure?